When Will My Partner Start Taking Responsibility For Conflicts? This is a question that comes up often with the men and women that come to me with relationship conflict. Each partner is waiting for the other to acknowledge that they did something that hurt him or her. Blaming is the way most 4 year olds deal with being caught ‘red-handed’ in some bad behavior. Many adults do not fare better. The key is for me to admit what I did first! Do not ask your partner to own his or her part in communication conflicts until AFTER you’ve communicated YOUR part. 1) I’m willing to speak first about what part I played in a problem we just had. 2) I’ll avoid defending and explaining myself. 3) It’s O.K. if I’ve upset my partner. Here is a sample of statements I invite you to make out loud to your partner tonight. Do not explain yourself, make excuses, or blame. Just say the words that you can agree with, from my statements. Notice what happens in your body, your mind, and your heart after you make one or more of these statements to your partner. This is Real POWER. Check the statements that may apply to YOU. There is no writing about the other in this exercise. This exercise does not allow you to talk about your partner’s behavior. The statements below are long form examples of what you might say to your partner BEFORE you try to get your partner to hear out, or understand your point of view. You may edit the statements below, if you like. ___ You have rarely heard me say, “I made a mistake.” That could make you feel as if I’m totally blaming you. I will try to tell you when I know I’ve made a mistake. ___ I can be very judgmental and act like a parent, or a boss, with you sometimes. That might make you think that I think I’m better than you. That’s not right, and I want to change that, without blaming you. ___ I have trouble saying that I’ve done something that hurt you. It makes sense you could think that I don’t care about you. I will be more sensitive to how I may have hurt you in the future. ___ My withdrawal from you emotionally is sometimes driven by wanting to hurt you. But, often my withdrawal is because I feel flooded, overwhelmed, confused and simply do not know how to express myself, or to deal with you. I can see how upset you get when I do that. I’m going to try to learn how to not withdraw from you. ___ Sometimes, I say I’m going to do something and I end up not doing it. I’ve said I would change something about my behavior and I didn’t follow through with what I said. I can understand how you might come to distrust my promises to change and feel resentful. It’s O.K. if you still feel distrustful now. In the future I’m going to work harder to do what I say and to say what I mean. The best way to hear your partner ‘own his or her part of the problem’; is for YOU to do it first! upcoming book, with 17 statements HERE. This 20 minute exercise WILL be an emotional experience for all couples who do it. For most couples, it will be a connecting & healing experience. 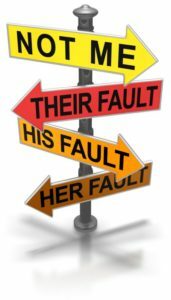 For some people, it will simply be information about the capacities of each partner’s ability to take some responsibility for problems in their relationship.